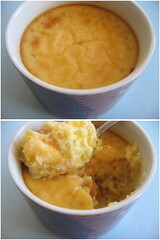 Baked Sago Pudding - Do You Know The Muffin Man? Notes: My uncle gave me a copy of a recipe from a magazine just before I left Hong Kong this summer. Baked sago pudding is often served in dim sum restaurants, and I remember a family friend making a very tasty version of it too. The sago must be soaked overnight, or, as this recipe directs, boiled in plenty of water until it is transparent. Next, I made two mixtures: one with eggs, custard powder, coconut milk and cornstarch, and the other with evaporated milk, water, sugar and butter. The latter is heated then combined with the former, and mixed together with the sago. After placing dollops of lotus seed paste in the bottom of ramekins, I poured the custard over top, then baked it in a water bath. I actually made a double batch to put in a large casserole dish, and had plenty leftover to fill some ramekins. The first thing I noticed was the mild flavour of the pudding. Aha! My Dad discovered a mistranslated ingredient: the Chinese list calls for condensed milk, not evaporated. That mistake aside, all the tasters really enjoyed this. It's a warm, comforting pudding with lots of complementary flavours, not too rich, but still satisfying. My only criticism would be the ho-hum flavour of the canned lotus seed paste, but I don't know of anyone who makes their own so I guess I'll live with it.